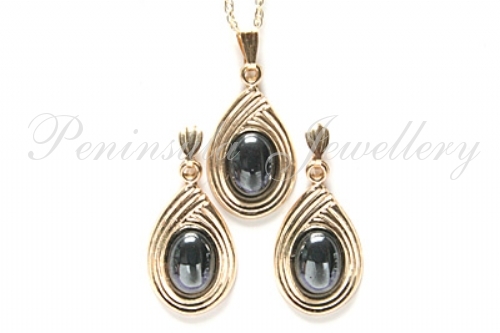 Pendant: Classic pendant featuring one 8x6mm Hematite Cabochon in a swirl design setting, with 9ct gold fittings. Overall dimensions: 11mm wide x 24mm long (including bail). Comes complete with an 18" Gold Prince of Wales chain. Earrings: Featuring 8x6mm Hematite Cabochons set in a swirl design dropper, with 9ct gold fittings. Overall dimensions: 11mm wide x 24mm long. Made in England. 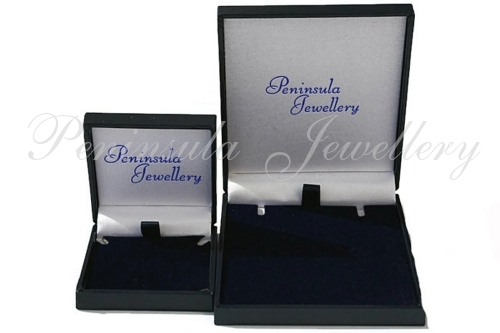 Supplied i a luxury gift box.